Previously, I wrote a post about childhood memories (with my grandad) and wrote about my favourite childhood treats, chocolate nibbles. When an email landed in my inbox offering me the chance to make some baking treats with Choc Nibbles, I obviously couldn't resist, and was even surprised to discover there was more to the range then what I thought! As I mentioned above, I got a surprise when I see how many varieties there was to the Choc Nibbles range, I naively only thought there was two options, the original Choc Nibbles, and the Toffee Choc Nibbles, however, there is a lot more than just these two yummy flavours! I was sent the following products to bake with, not to snack on, but to bake with, I had to remind myself so so many times, and Spud too! When it come to choosing what to make with the products, I was truly spoilt for choice, I could of made cupcakes with them, a cheesecake, muffins, brownies and much more! However, because I had Spud here helping me out with everything (I don't think he really want to help, I think he just knew it was a quicker way to enjoy the treats!) I decided to go with simple, but yummy baking makes. 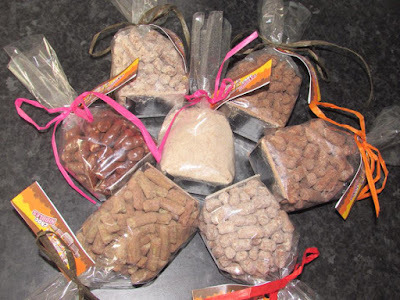 We had a family meeting, which included the puppy, and we had our final decision, we was going to make chocolate truffles using both digestive biscuits and dessicated coconut, rolling them into the Original Choc Lick. 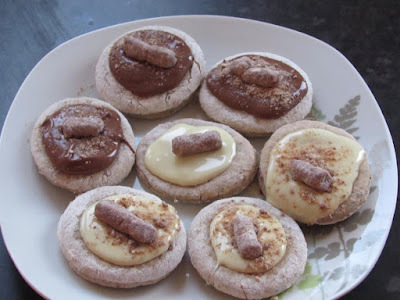 For the range of Choc Nibbles themselves, we settled on mini sweet pizza's! Both small makes and bakes, but both delicious and yummy too! Some flour for the kitchen side or chopping board. 1 x 7g sachets dried yeast. 150ml (½ pint) of warm water. 1: Sift the flour into a large mixing bowl, then add the caster sugar, yeast and salt into the flour, finally add the oil and water, then mix the ingredients together using your hands. 2: Mixing with your hands, make a smooth dough ball. 3: Flour your chopping board or kitchen side, make sure its clean first! 4: Knead the dough for 10 minutes until its elastic. 5: Leave the dough in a bowl, covered with cling film or a damp tea towel, until the dough has doubled in size. This usually takes over an hour. 6: Knead the dough for a further two minutes then roll into miniature pizza bases, I used a cookie cutter for this. 7: Leave the miniature bases on a cooking tray for 10 minutes for them to rise. 8: Cook in the oven for 10-12 minutes at 180° (electric oven) or gas mark 4. 9: Leave the miniature basis to cool. White, milk or dark chocolate, or even jam or chocolate spread! Water - to boil, to melt the chocolate. 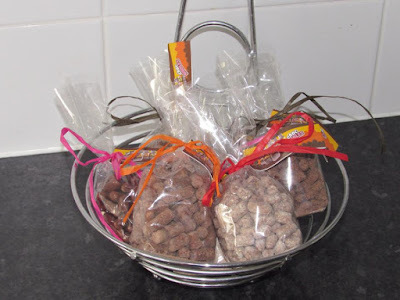 Choc Nibbles - any flavour or even a mixture! 1: Melt the chocolate in a glass bowl, over hot water in a pan. 2: Spread the chocolate onto the pizza bases. 3: Allow to cool for 10-15 minutes on a cooling tray. 4: Once cooled add a Choc Nibble, or even a few. 5: Sprinkle with Original Choc Nibble. Who said pizza had to be savoury? As a nation, we love sandwiches, and fill savoury bread with sweet fruit jams, and sweet spreads including chocolate spread, so although this make was a gamble, I am so glad we done it, because they tasted delicious! We've all eaten left over cold pizza, so the idea of the pizza's being cold wasn't a problem for either of us! We can't wait to make these sweet bakes again, but next time, I think we'll try jam and chocolate spread! Small tin of condensed milk. 10 digestive biscuits, crushed in a sandwich bag - place the digestives into a sealed sandwich bag and bash with a rolling pin until they're crushed. Bowl for Original Choc Lick. 2: Add the condensed milk into the melted chocolate and mix together for one minute. 3: Remove the bowl from the pan, be very careful as the bottom will be extremely hot. 4: Add the crushed digestives or dessicated coconut into the melted chocolate and mix well with a spoon. 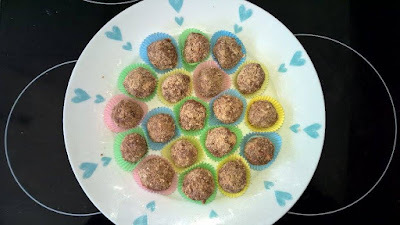 5: Roll the mixture into truffle shaped balls using your hands. 6: Place the truffles into a bowl, and roll in Original Choc Lick. 7: Place the truffles into miniture cake/truffle cases and then place onto a plate. 8: Leave to set for an 90 minutes in the fridge. To find out more about Choc Nibbles and to view their full range, check out the official website here.